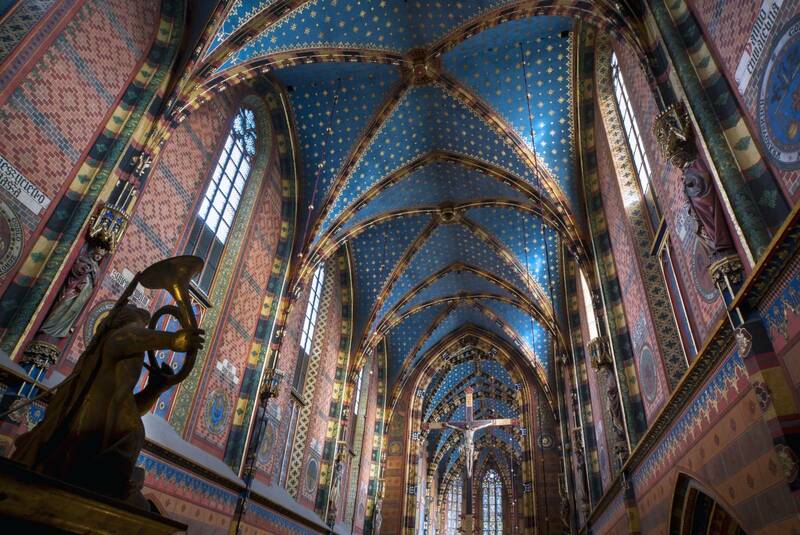 A history spanning over eight centuries, a high altar by Veit Stoss (Wit Stwosz), a bugle call, the star strewn murals by Jan Matejko covering the vaulting: all this in a single church! Moreover: in the very centre of Kraków! The first church was raised in this place even before the chartering of Kraków; it fulfilled the function of the main parish church of the city since 1222. Its pre-charter pedigree explains why the Basilica (Church) of St Mary is situated at an angle towards the axis of the Main Market Square: simply, when the first edifice was being constructed, the Main Market Square did not yet exist! Now its Romanesque remnants are hidden 2.6 m (9 ft) deep under the floor of today’s church, together with elements of a later, early-Gothic one. The body of the church that we can admire to this day dates back to the second half of the 14th century. 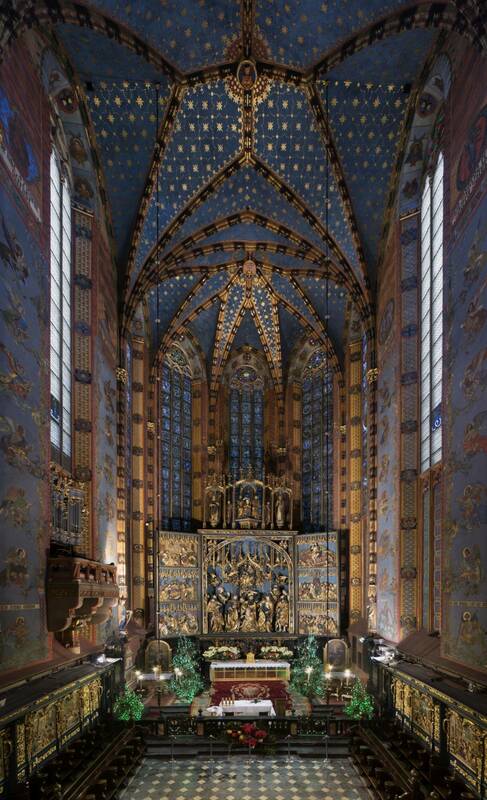 The initiator of the transformation was a rich merchant, Mikołaj Wierzynek, who founded an impressive chancel. The three-aisled corpus was appended later, and fronted from the west (i.e. from the side of the Main Market Square) with two towers of different height. In the 15th and 16th centuries the church was surrounded by side chapels, and in the mid-18th century its main entrance received a porch designed by Francesco Placidi, a Roman architect and sculptor, considered the greatest artist of the late baroque. It’s worth starting your visit to St Mary’s by admiring the exterior. On the outer walls you will find many epitaphs to Kraków burghers: relics of the parish cemetery that used to surround the church until the end of the 18th century (see: St Mary’s Square). Now it is time to turn your gaze upwards and savour the towers. The taller one, standing 81 m (266 ft) tall is crowned with a magnificent late-Gothic spire. Known as the guard or bugle call tower (strażnica, hejnalica), it has always belonged to the city: from the late Middle Ages a guard kept watch from its top day and night, looking for fires, enemies approaching Kraków, and other potential dangers. His duties also included playing the bugle call on a trumpet; initially at dawn and dusk only, to signal the opening and closing of the city gates, and from the 16th century onwards – on the hour, every hour, to mark the time. The bugle call became the musical symbol of Kraków and it resounds from the tower to this day: it is played to the four sides of the globe on the hour all day long. Yet, why does the melody break off mid-note? Legend has it that a guard began to sound the alarm having noticed the approaching Tatar hordes. He managed to warn the city of the attack, yet his throat was pierced by a Tatar arrow while playing. This is the reason why the melody of the bugle call ends so suddenly: precisely when the heroic guard stopped playing it. The other, lower tower (69 m/226 ft) contains a complex of five bells, the oldest of which, the Pół-Zygmunt, dates back to the 15th century. Tradition has it that the strongman Stanisław Ciołek carried it up to the tower without any assistance. The difference between the height of the two towers, finding no justification in the plans of the architects, is explained by another legend. They were built by two brothers. When the younger one realised that his was neither as high nor as beautiful as the other tower, he got hold of a knife and killed his elder brother in envy. Yet remorse plagued him: on the day of the consecration of the church, he thrust the very same knife into his heart and jumped, or fell, from the top of the church tower. The knife he purportedly used can be seen hanging in the Cloth Hall to this day, recalling that sombre story. On the southern wall of St Mary’s, outside, just by the entrance, you can see iron rings called kuny that were fastened around the necks of sinners. You could find yourself clamped in these for adultery, drunkenness, evading promised marriage, failure to observe fasts, working on Sunday and church holidays, and even for petty theft. People locked up here could be freely mocked and jeered at by those entering the church, so many locals breathed a sigh of relief when this church penalty was withdrawn (albeit very late: in the 18th century!). It is worth letting yourself be placed in the kuny of your own free will: they say that it is a way to secure luck and constancy in love for yourself. 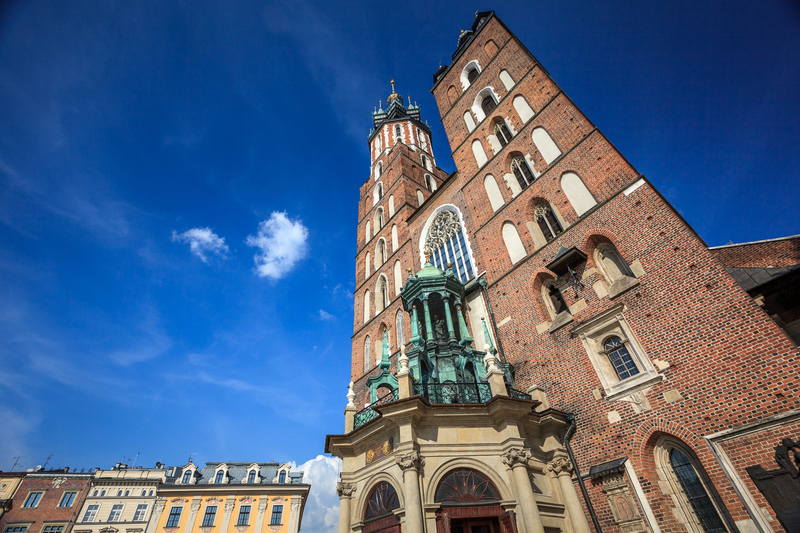 The church, being the main parish of the city, enjoyed the support and protection of opulent burger families, and therefore you can find many precious works of art and relics of the Kraków patriciate within. The most important precious object in St Mary’s is its high altar, the masterpiece of Veit Stoss (Wit Stwosz) and the greatest achievement of late mediaeval sculpture. Its history began with a masonry disaster: in 1442, the vaulting of the chancel of St Mary’s caved in and fell, destroying the altar. At the time, city councillors decided to build a new one, worthy of the capital city. They chose the contractor: Wit Stwosz, a sculptor living in Nuremberg. The commission brought the artist riches, plenty of clientele, and eternal fame. For his work, the sculptor received the staggering sum of 2808 florins, which was equivalent to the city’s annual budget! The monumental altar was built from 1477 to 1489. Its structure, made from oak and limewood, is 13 m high and 11 m wide (36 × 43 ft). 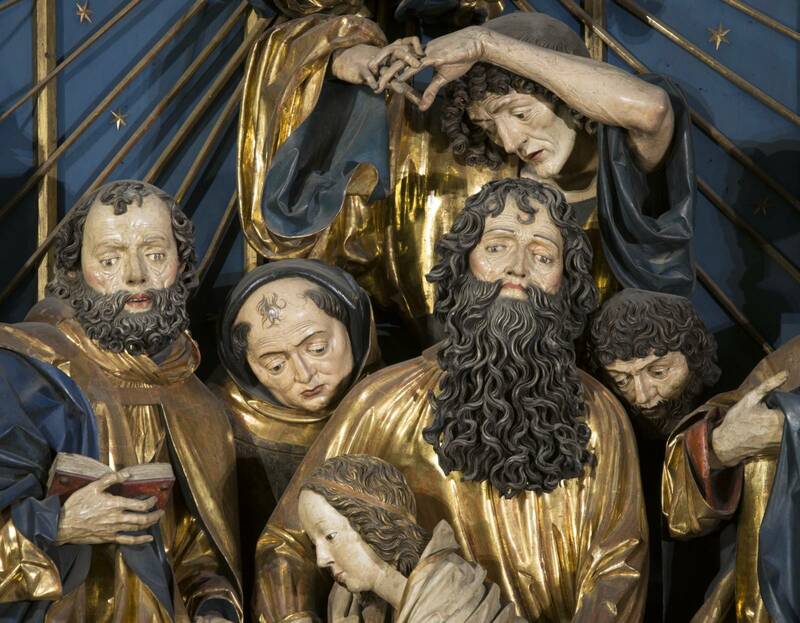 The figures in the main scene portraying the Dormition of the Blessed Virgin Mary surrounded by apostles are nearly 3 m (10 ft) tall. 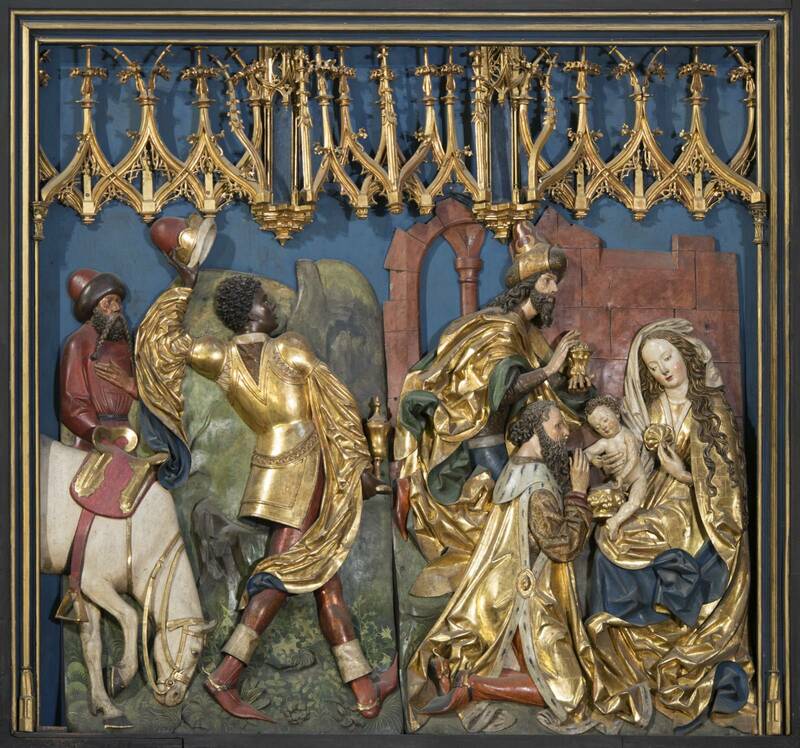 The two moving and the two fixed wings of the altar are filled with scenes from the life of Jesus and His Mother, altogether encompassing over 200 figures carved from limewood blocks. 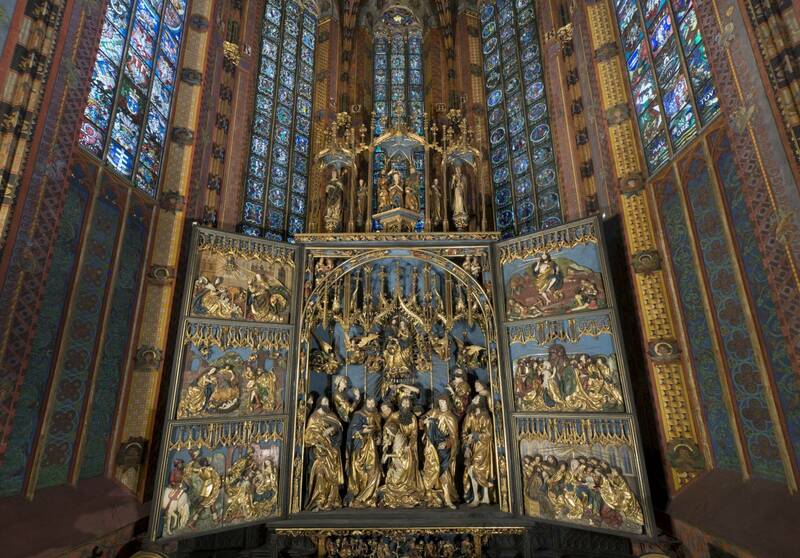 The predella (the base of the altar) is a depiction of the Tree of Jesse, that is the genealogy of Mary and Jesus, while the whole structure is crowned by a scene of the coronation of the Blessed Virgin and figures of the patron saints of Poland: St Adalbert (Voitek) and St Stanislaus. Apart from its stunning beauty, the unique features of St Mary’s altar also include realism. Stwosz gave the figures the features of his contemporaries, rendering all the details rather than only the most beautiful ones: some palms are disfigured with rheumatism and hard work, the hair on some skulls is visibly thinning, and veins can be seen clearly under the taut skin. Our attention is also riveted by the 19th-century polychrome murals: the work of master Jan Matejko (the starry skies are another of his ideas) and his students, including Stanisław Wyspiański and Józef Mehoffer, eminent designers of the stained glass decorations in the window of the western wall. ciborium: a Renaissance work of the sculptor Giovanni Maria Padovano, consisting of a tabernacle for the communion bread (the host) and its architectural setting (where the chancel meets the southern wing of the transept). Half of the church, including the chancel and the high altar, is open to visitors. The other half of the church (accessible through the main entrance) is designed for personal prayer, and accessible throughout the day free of charge.